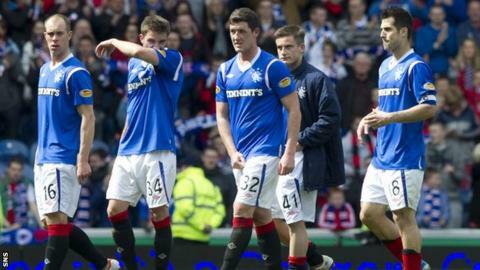 An expert in sports law has backed PFA Scotland's claim that Rangers players can walk away from Ibrox once the club forms a new company after liquidation. "They are no longer in a contractual relationship with either old or new Rangers," suggests David McArdle. Charles Green, who leads the consortium looking to buy the club, insists that players would be in breach of contract if they did not join the newco. But the players' union says its members are not obliged to join Green's club. That view is backed by McArdle, who is senior lecturer at the University of Stirling's Law School and an editor of the Entertainment and Sports Law Journal and believes that no sanctions could be taken against players leaving to join other clubs. "The players, admin people, front-of-house staff will all be in receipt of an opportunity to have their contracts transferred - but they are under no obligation to accept employment with the new employer," he said. "They can reject the contract offer which the new employer is obliged to make and take their chances elsewhere. "If they choose to do so then, by definition, there is no contract for them to breach." The Transfer of Undertakings (Protection of Employment) (TUPE) regulation ensures that all employees are given the chance to join the new company under the same terms. However, there is some doubt in football circles about the ability of players to transfer their registration, which is held by the Scottish Premier League - world governing body Fifa has so far been silent on the matter. "In terms of football's own regulations, I don't have the Fifa player statutes to hand, but I would expect they are silent on this matter - those regulations exist to promote contract stability and, if there is no contract anymore, there is nothing to stabilise," said McArdle. "If I am wrong in that and the Fifa regulations do purport to cover a TUPE-type matter then, if they purport to deny employees the sorts of rights that TUPE confers, I would expect the Court of Arbitration for Sport, or - failing that - the Swiss courts on appeal from the CAS, to strike them down as incompatible with fundamental principles of free movement and competition law, which are no less applicable under Swiss law than they are under EU or UK law. "It would be incompatible with EU law for those regulations to force a player to join a new club against his will. "Once the contracts with old Rangers come to an end, there isn't a contractual stability issue anymore and I would confidently expect CAS, the Swiss Courts, the European Courts, the Scots Courts or the Court of King Arthur not to uphold any provision which purports to force TUPE-protected employees to take a course of action which is contrary to TUPE itself."